Notes: Knight of the Garter. 3°V. Hereford. The Complete Peerage vol.V, pp. 141-142 & p329. The Devereux Family traces its descent from Robert D'Evereux, who came over with William the Conqueror and settled in Hereford. 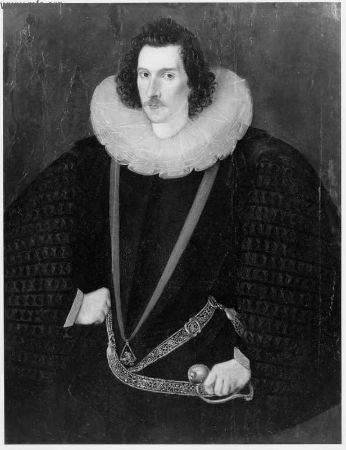 Passing over the intermediate generations, we draw attention to Walter Devereux, Lord Hereford, born 1541, and married in 1561 to Lettice, the eldest daughter of Sir Francis Knollys, Knight of the Garter. The young pair lived at first quite retired upon their estates and were much troubled with financial difficulties. The first son of Walter and Lettice, succeeded to the earldom on the death (1576) of his father, he came under the guardianship of Lord Burghley and soon won favor at court. A handsome young man with a dignified bearing and with great dash and spirit; but with a domineering egotism, his impulsive ill disciplined and jealous nature and his unreasonable ambitions were as yet concealed. 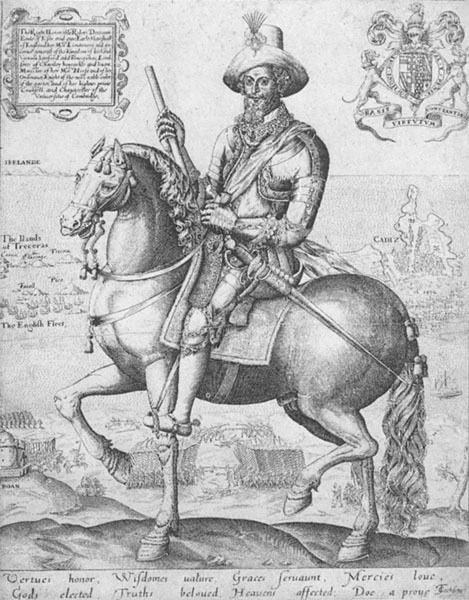 He distinguished himself in action while serving (1585-86) as a cavalry officer in the Netherlands under his stepfather, Robert Dudley, Earl of Leicester; he was knighted for gallantry. When he returned to England he soon became a marked favourite of the ageing Elizabeth I, who met him 1587, her age 54, him age 20, promoted by his stepfather, who shortly AFT died 1588. 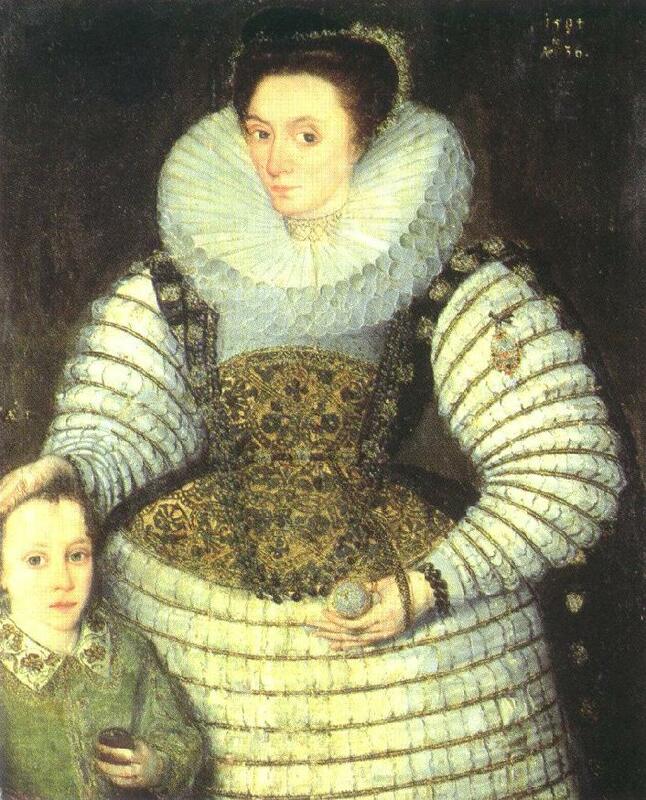 Essex became Elizabeth’s master of horse in 1587 and was given the Order of the Garter, the oldest and highest of honors, in 1588. In May, 1587, a courtier reported, the Queen often had “nobody with her but my Lord of Essex; and at night my Lord is at cards, or new game or another with her, that he cometh not to his own lodgings till birds sing in the morning”. Whereas Queen Elizabeth was very cautious in military adventurers, Essex had been much in favor of a much stronger military role for England in Europe, and became an inspirational figure for the military and the adventuresome spirit of England in this period. In addition, he assumed the role of leader of the Puritan movement in England from his stepfather Robert Dudley. The position of favorite of the Queen involved him in a quarrelsome rivalry with Sir Walter Raleigh. In 1590 he angered the Queen by secretly marrying Frances Walsingham, daughter of the Elizabethan spy master Sir Francis Walsingham and the widow of Sir Phillip Sidney. The following year he commanded a flamboyant but unsuccessful expedition to Normandy to help Henri of Navarre (Henri IV of France). He returned home and, advised by Francis Bacon, entered politics in an effort to seize power from the aging Burghley. In 1593 Elizabeth appointed him to the Privy Council, the work horse of Tudor government staffed by her most trusted counselors. But Essex was too obvious and impetuous in his demands on the Queen. For every vacant office Essex had a candidate whom he urged upon the Queen with pressing importunity. There were stormy scenes between them once Elizabeth boxed his ears. Meanwhile, the rivalry of the two factions became general. Elizabeth was wary, and gradually she conferred the power he sought on Burghley's son, Robert Cecil (later Earl of Salisbury). 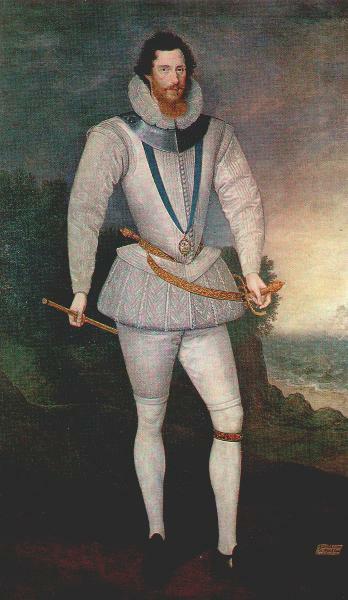 Essex became a national hero in 1596, when he shared command of the expedition that captured Cádiz, his popularity threatening to eclipse that of the Queen. But he failed the next year in an expedition to intercept the Spanish treasure fleet off the Azores. 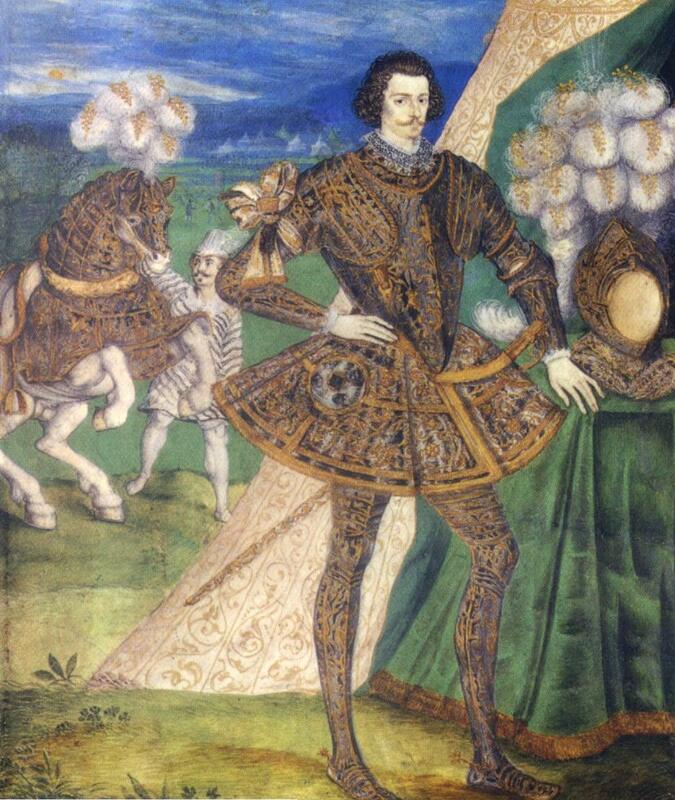 In 1599, at his own demand, he was made lord lieutenant of Ireland and sent there with a large force to quell the rebellion of the rebel Hugh O'Neill, Earl of Tyrone. 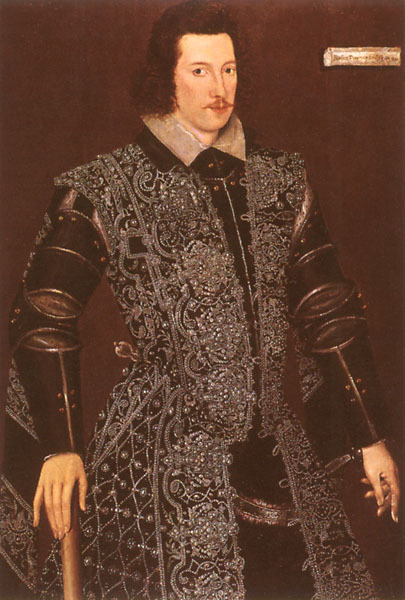 Essex request the Earl of Southampton to join him in Ireland as his number two commander. Queen Elizabeth disagreed with the Southampton appointment. From a mind delighting in sorrow; from spirits wasted with travail, care, and grief; from a heart torn in pieces with passion; from a man that hates himself and all things that keep him alive, what service can your Maj. reap? Since my services past deserve no more than banishment and proscription into the most cursed of all countries, with what expectation or to what end shall I live longer? No, no, the rebel's pride and successes must give me means to ransom myself, my soul I mean, out of this hateful prison of my body. And if it happen so, your Maj. may believe that you shall not have cause to mislike the fashion of my death, though the course of my life could not please you. This letter may well have been amongst those couriered by Bacheler, lutenist and servant to Essex’s wife, Frances Walsingham, employed to carry documents out of Ireland. A copy of the letter appears in the Lute Book of Captain Mynshall, a young officer that accompanied Essex into Ireland. Then Essex conceived the treasonable idea of using the young gallants in his train to force Elizabeth to ruin the Cecils and to give him predominance at court. Failing completely to accomplish his mission, he made an unauthorized truce with Tyrone and returned to England against the Queen's orders. On his arrival, after a brief audience with the Queen, he was committed to the custody of Sir Thomas Egerton, and charged with "great and high contempts and points of misgovernance" in Ireland. He was confined by the council, and it was eight months before he was tried for disobedience by a special council and deprived of his offices (1600). He was soon released but was banned from the court; Essex was not allowed to approach the Queen. Barred from court the immediate Essex circle included his sister, Lady Rich, her lover Lord Mountjoy, Sir John Harrington, Sir Charles Danvers, the Earl of Rutland and the Earl of Southampton. 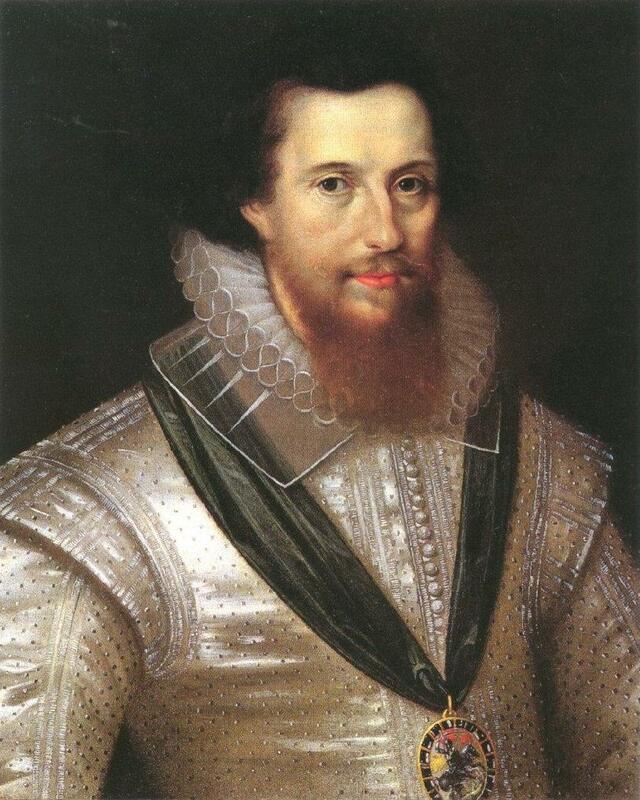 Also included was the Earl of Bedford and Robert Radcliffe, Earl of Sussex. Brooding over his wrongs, insanely jealous of the Cecils and using violent language against the Queen, he allowed his house in London to be come the resort of swordsmen, bold confident fellows, discontented persons and such as saucily used their tongues in railing against all men. Still popular, Essex planned a coup that would oust the enemy party and establish his own about the Queen. To this end he sought support from the army in Ireland and opened negotiations with James VI in Scotland, but these efforts failed. Desperately, he made his attempt of rebellion with a small body of personal followers on 8 Feb 1601. The Londoners failed to respond, the Queen's government was thoroughly prepared, and he was arrested. At the trial Bacon contributed heavily to his former patron's conviction. 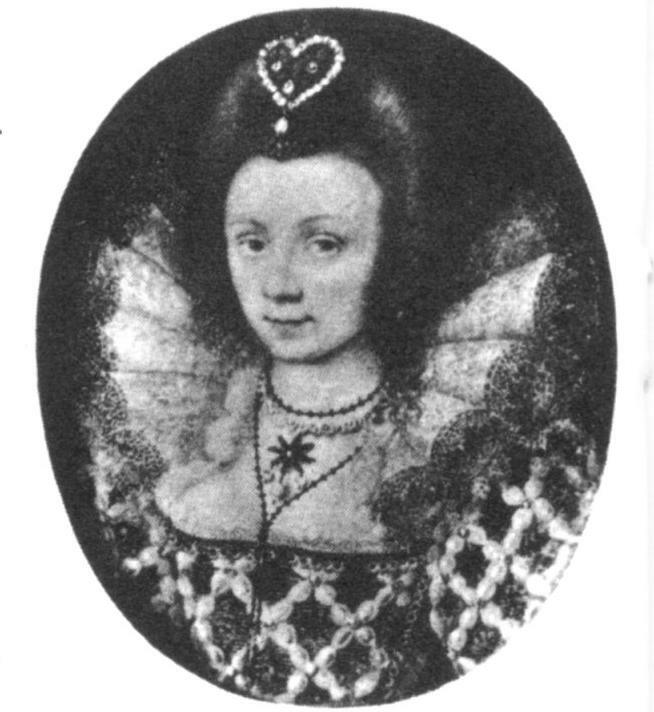 Elizabeth, after some hesitation, signed the death warrant, and Essex was executed. L. Strachey, Elizabeth and Essex (1928, repr. 1969).